Pollinators aren't just bees, butterflies, beetles and bats. They're also birds, like hummingbirds. Ornithologists tell us that hummingbirds can easily eat their weight in a day, feasting on carbohydrates (nectar from blossoms and sugar water from feeders) and protein (insects and spiders). The hummingbird menu includes such insects as ants, aphids, fruit flies, gnats, weevils, beetles, mites and mosquitoes. They also raid spider webs to grab a quick spider meal and any hapless insects trapped there. 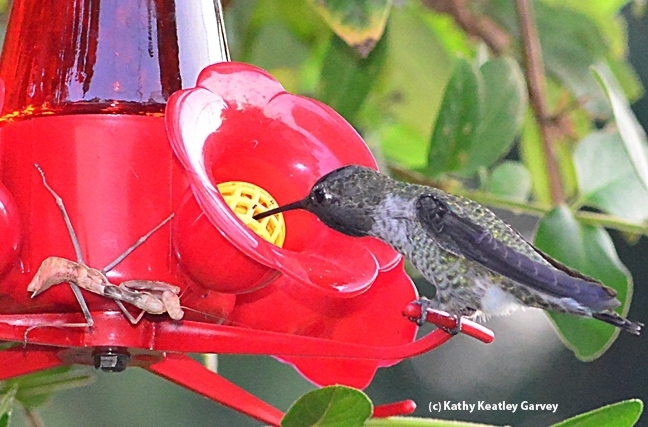 We were thinking of insects and pollinators today (this blog focuses on insects and the entomologists who study them) after reading a UC Davis research paper published in the Proceedings of the Royal Society B that tested sugar water in hummingbird feeders. 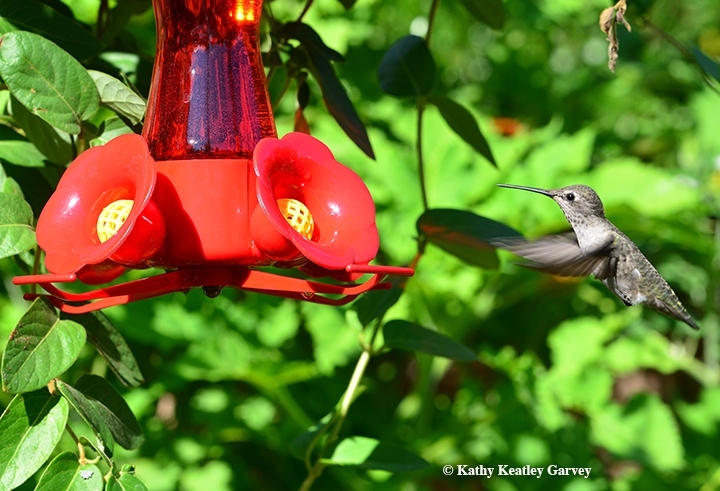 Fact is, sugar water in hummingbird feeders can contain high densities of microbial cells but “very few of the bacteria or fungi identified have been reported to be associated with avian disease,” says community ecologist and co-author Rachel Vannette of the UC Davis Department of Entomology and Nematology. The research is one of the first to explore the microbial communities that dwell in sugar water from feeders and compare them to those found in flower nectar and samples from live hummingbirds. The paper, “Microbial Communities in Hummingbird Feeders Are Distinct from Floral Nectar and Influenced by Bird Visitation,” is the work of first author Casie Lee, a UC Davis School of Veterinary Medicine student; Professor Lee Tell of the UC Davis School of Veterinary Medicine's Department of Medicine and Epidemiology; Tiffany Hilfer, an undergraduate student and Global Disease Biology major; and Vannette. Lee, mentored by Vannette and Tell, led the field experiment and performed bird observations and laboratory work during a summer project funded by the Students Training in Advanced Research (STAR) and Merial Veterinary Scholars Programs. The researchers also compared the microbes in the feeders to those in floral nectar and found they differed in microbial composition. The UC Davis scientists conducted their research at a private residence in Winters, attracting two hummingbird species, Calypteanna (Anna's Hummingbird) and Archilochus alexandri (Black-chinned Hummingbird) to drop net feeder traps. They mixed bottled water with conventional white granulated sugar (one part sugar and four parts water). See more information--and photos--on their research on the UC Davis Department of Entomology website. But back to insects and the hummingbirds that eat them. Entomologist Doug Tallamy of the University of Delaware says that "hummingbirds like and need nectar but 80 percent of their diet is insects and spiders." Wildbirds on Line says: "I frequently put overripe bananas of my fruit feeder to attract tiny fruit flies, which in turn attract the hummers. The hummingbirds eat every fly and return in a few hours to feast on the next batch of fruit flies that discover the overripe fruit. What an easy way to observe hummers eating insects!" Now that's an idea! Fruit flies for the hummers!